RAINIER NATIONAL PARK, Wash.—High in the alpine meadows surrounding Washington state’s Mount Rainier, Native American tribes gathered huckleberries and other traditional plants every autumn for thousands of years. After the area became a national park at the turn of the 20th century, their tradition of collecting plants was outlawed. The law was a blow to the tribes, who depended on the mountain’s resources for their livelihoods and cultural traditions. That ban was finally overturned in July, when the National Park Service (NPS) issued a new rule opening up the parks to plant collection by tribes that could show their practices were traditional and sustainable. Members of tribes in the Mt. Rainier area welcomed the new rule and said it would make their traditional ways of life easier to uphold. "They didn’t recognize us as indigenous people of this land." Harvesting grasses to make those baskets is a crucial part of the process, Hanford McCloud said. But that has become increasingly difficult since traditional lands were claimed as national parks. The Nisqually people have many historical ties to the Mt. Rainier area, Hanford McCloud said, but their rights to the land and its resources have constantly been questioned. When Mt. Rainier became a park, it took away from the tribe’s ability to access it for hunting and gathering, Hanford McCloud said. “This was always our land; our people have been here since time immemorial,” said Joyce McCloud, Hanford’s mother. She sat in on negotiations with the Mt. Rainier National Park (MORA) authorities in the 1990s when the Nisqually first began fighting for their rights to gather plants from the park again. “They brought me because I knew a lot about plants; I’d let them know what we’d come up and gather, which ones we don’t gather,” Joyce said. Berries from six different huckleberry strains, bear grass for basket weaving, cedar bark for textiles, and dozens more plants were historically collected by the Nisqually and other tribes in the area including the Cowlitz, Yakama, Puyallup, and Muckleshoot. The tribes would migrate to higher elevations in the fall for what they informally called "huckleberry camp." From the river valleys below, they would hike through the sub-alpine forests, past lakes, and even go above the tree-line in search of the berries. The tribes would camp in alpine meadows under rugged snow covered peaks long enough to pick and dry the berries. “My great aunt told stories about going up there as a little girl, meeting other tribes and other native people. It was kind of like a big gathering,” Joyce McCloud said. As some gathered plants, others went hunting for elk, deer, and game birds. Traveling to those elevations to collect the traditional plants was seen as a duty for members of the Nisqually tribe. Rather than being harmful to the plants, harvesting was seen as promoting health and new growth in the plants. Techniques for gathering sustainably were passed down through Nisqually traditions. One of the six huckleberry strains found in Mt. Rainier National Park. Under the new NPS rule, each tribe will have to prove their methods are sustainable by carrying out environmental studies. Tribes must also create a list of traditional plants they wish to harvest and explain what they are used for. How long that process takes could vary, Jeffrey Olson, a public affairs officer with the NPS, said. “It’s up to individual tribes to initiate the process to reach an agreement. It’s difficult to say how long the process would take,” Olson said. “It depends on where a tribe wants to collect plants and if there are any endangered species in those areas and other environmental issues." The Nisqually are in a unique position as they have been through a similar process before, when Joyce and others began fighting for their rights to collect at MORA in the early 1990s. They were given plots of land from a field of bear grass and told to collect in the traditional manner for three years, Joyce said. The state park would then determine whether their techniques were sustainable. “They had these little plots in a whole field of bear grass…I showed them how to pull the grass, and the next year we came back and did it again,” Joyce said. “I noticed how our plots were a little higher than the other ones, which were kind of dried out because nobody picked them,” Joyce said. After three years, their plots had flourished and they gained legal access to harvest in the park in 1992. Traditional collection methods are passed down through the generations, Joyce said. When gathering princess pine, Joyce’s favorite plant which resembles a mini pine tree, the key is to only pick a few handfuls from each and leave the flowers and the seeds, then move on to another spot. For bear grass, the middle layers of the plant are harvested, not the new or old blades. Following traditional methods like these, Joyce said they see more growth in the area in general each year. The Cowlitz, another tribe that traditionally gathered plants in MORA, agreed, saying tribal conservation practices ensured that no plant resources were over-harvested. "It's a longstanding custom that we gather only what we need and respect resources through traditionally taught practices." “It's a longstanding custom that we gather only what we need and respect resources through traditionally taught practices,” said Taylor Aalvik, natural resources director for the Cowlitz. Even as they left after huckleberry camp in late fall, they would set fires to maintain “open and productive” alpine habitats, Aalvik said. 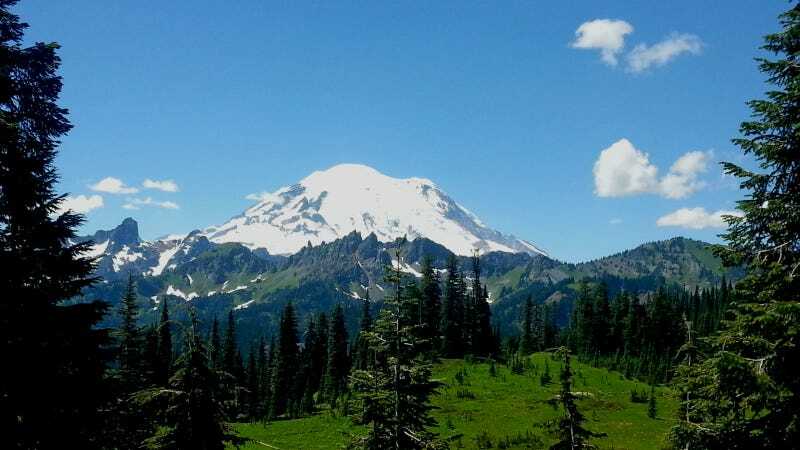 Tribal members disagreed with the notion that fencing off an area and keeping them from continuing their thousands of years' old land management practices would protect the Mt. Rainier area. “It is an error to believe that the Pacific Northwest was a wilderness, or was absent humans in the pre-contact era,” Aalvik said. “Conservation of natural resources or restoration to pre-settlement conditions frequently means returning to an indigenous type of management regime,” Aalvik said. Hanford and Joyce McCloud said they still go up to the mountain, as a tribe and as a family, to give talks at campgrounds about traditional plants. They also maintain contact with MORA staff, in the hopes that they can help with conservation. “It opens up the avenue of communication, and let’s them know we are still here,” Hanford McCloud said. Olson said they hope everyone joins in the stewardship of America’s national parks, but didn’t say whether the new rule could lead to a bigger role for tribes in NPS conservation projects. “This will be an issue we can work on together to support unique cultural traditions and the mission of the National Park Service,” Olson said.